In a complex convergence of architecture, landscape and artwork sits the Abington Art Center. Originally an estate named Alverthorpe Manor, the house was replaced in 1939 by a Georgian-facaded Art Deco interior, retaining its name and the lovely 27 acre site and filling its then newly built museum wing with an impressive rare-book and prints collection which was generously shared with visitors and scholars. 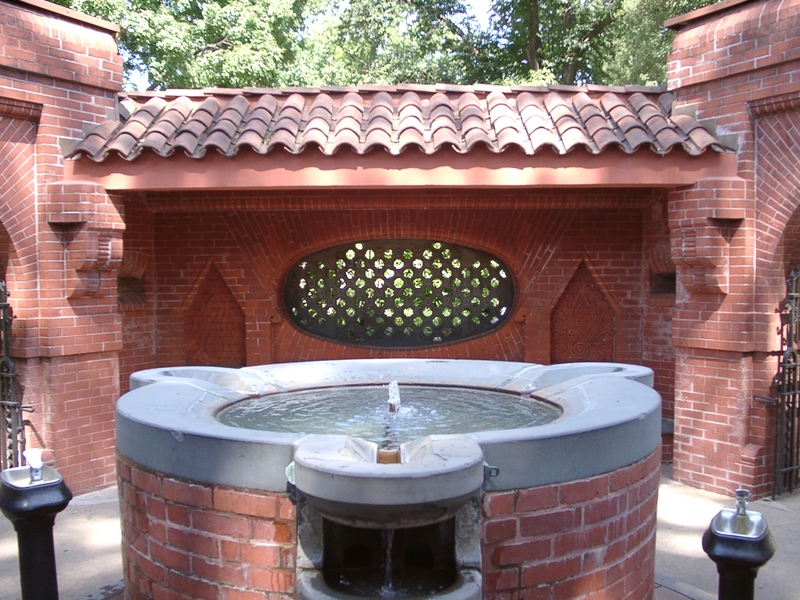 The owner, Lessing J. Rosenwald left the property to Abington Township, Pennsylvania, and his collections to the National Gallery and the Library of Congress; afterwards, a local art guild moved its operations into the property to serve as an expanding cultural center for the community, including a sculpture garden in 1990. The grounds are close to ideal for this purpose with varying terrains of stone-walled terraces, sloping broad lawn and vast woodlands. Generally speaking, the scale of the art pieces is smaller than one would expect in a setting such as this, the few larger works having been sited closer to the house; and the woodlands tend to be occupied by environmental works that intentionally disintegrate over time – politically correct, perhaps, and educationally instructive, but not conducive to placeness on the whole. There are a few exceptions, though: one on a house-adjacent patio, the other an early acquisition in the woods. Who would expect a furniture maker to create a space rather than merely populate one? 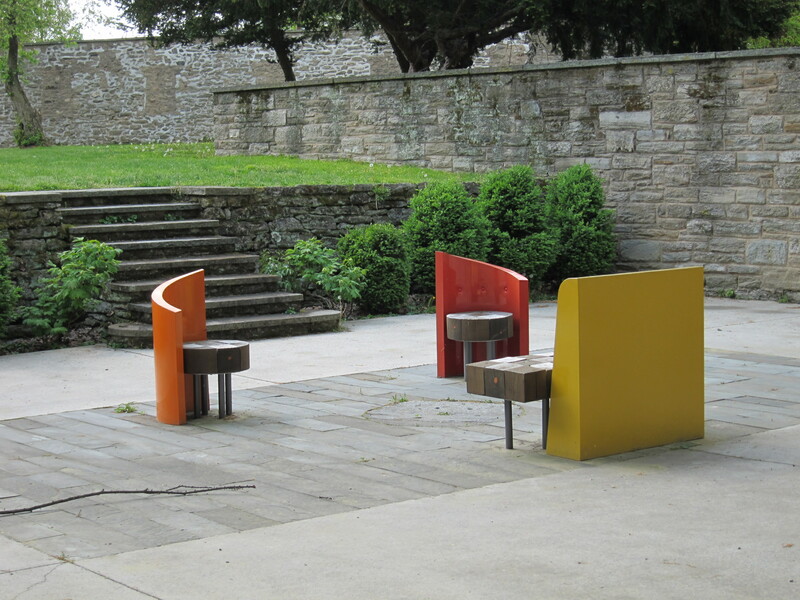 A suite of three seats – a banquette and two chairs in a triangular configuration – sit on a flagstone patio outside the original museum wing, nestled between the stone building facade, a 6’-high stone garden wall, a 4’-high terrace wall with stone stairs and a curvy deconstruction of a kiosk made from perforated metal, with signage and information about the sculpture park. The patio, a rectangle made from end-to-end narrow “planks” of flagstone, with an old round mill stone recessed at its center, is situated nicely as a sunken garden room with a sense of place as a given. But, empty or even with normal placed furnishings it would not have the balanced pairing that it does now with Jack Larimore’s quirky functional objects. They have a modern feel but are difficult to align to any particular modern period, harkening to the 1950s but with a more Postmodernity in their attitude and self-awareness. 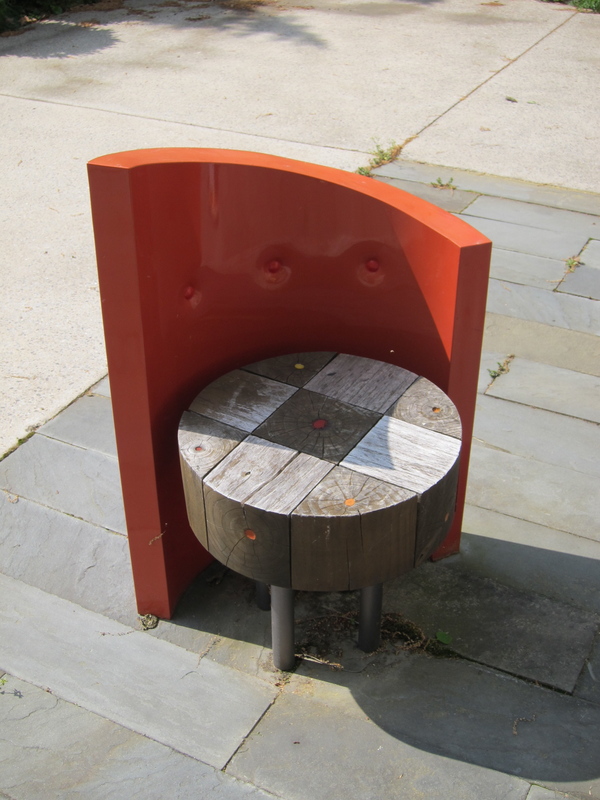 They are simple: tubular legs, enameled metal backs and square wooden blocks fashioned into a nice checkerboard for their seats, now weathered gray to match the color and texture of the surrounding stone. In their simple curves, small stature and asymmetrical flourishes they are animated. Their own checkerboard patterns along with the flagstone pattern they sit upon conjure a kind of through the looking glass, bizarro world, yet they are tactile and delightful objects, perhaps their objectness making them resemble chess pieces. 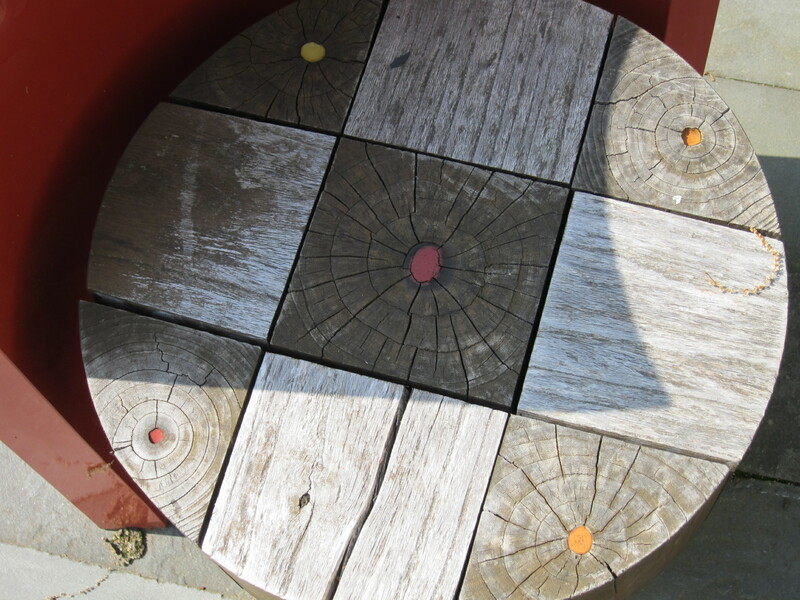 Their backs are colorful, and, if you look carefully at the wooden seats, the knotholes are filled with resin colored from the same palette. Besides the seating being fun and design-y, it actually peoples the patio in the sense that the pieces, by themselves, project a strong presence in conjunction and collaboration with the space: the interaction between them and their setting is an elaborative and interactive one, and a self-sustaining one, too. The woodland piece, down a long and not so distinct path on the same side of the property, seems unfinished and perfect the way it is. The sensibility is very different from the previous work, and yet is just as effective in its synchronicity with its site. Once a larger arrangement of elements (now decomposed) spread about a large tract, Winifred Lutz’s “A Reclamation Garden” has some fragments and ghosts still in evidence. 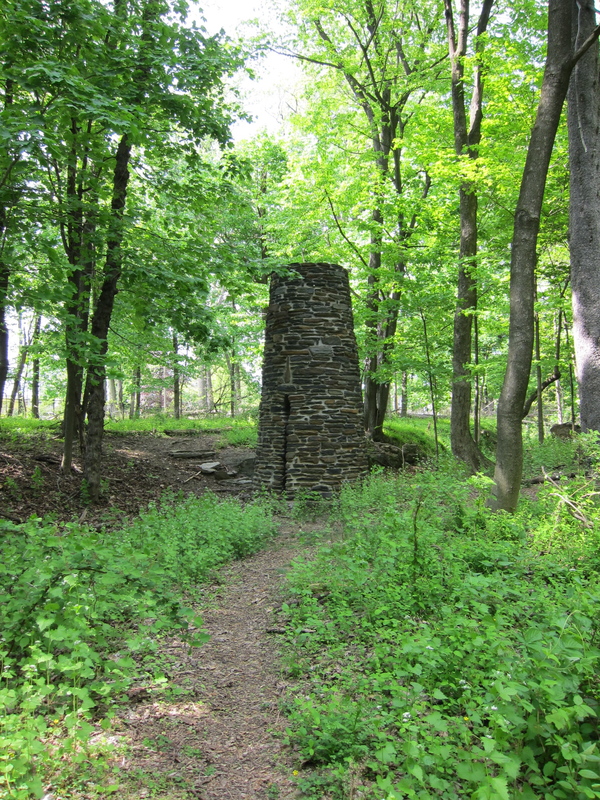 One remaining built structure, a chimney form, stands like an ancient observatory, or a cooling tower between the earth and sky. 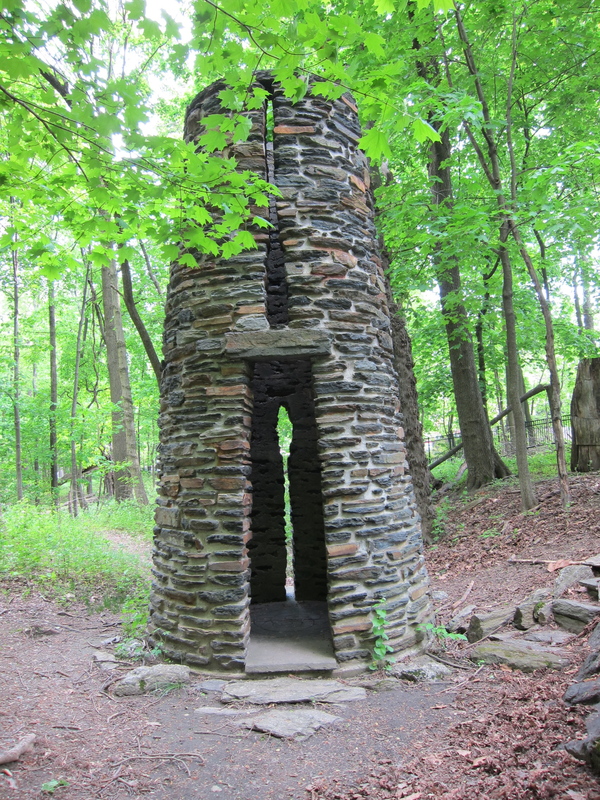 About two stories tall, built of stone in a conical shape and seated in a dry creek bed which may not always be dry, it is placed in a way that not only makes it a signpost but puts it in a dialogue with a “real” ruin of an arched stone bridge that spans the once-active creek. Which is older – the tower or bridge – is mystifyingly in question, since the artwork seems more primitive in its form and function, whatever that might have been. Its stone walls are pierced by openings reminiscent of a turret’s arrow slits, but once you enter through a slightly wider portal, you see the real use of the negative spaces – framing devices to focus the mind’s eye on surrounding nature. The top is a perfect circle, an oculus aimed up at the swaying treetops and passing clouds, kind of a telescope or periscope to the sky garden. The narrow slits at varying heights frame distinct views, possibly at particular points of the compass; they also let in light and air. The floor, a solid circle with incised circular patterns, makes the place feel ritualistic. 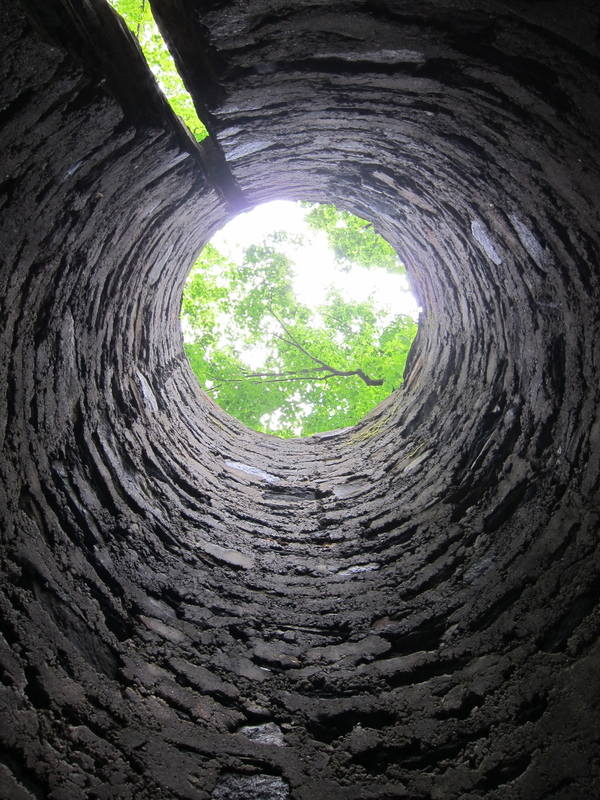 One can imagine that, when the creek is not dry, the water flows right through the tower, covering the floor patterns, or perhaps allowing visibility depending on the water’s depth, and rendering the creek a natural runnel through the structure. Whether it had a purpose at one time as a solar tracker makes no sense now in such a heavily wooded site, causing you to think that the flora has grown around it, giving it the age-appropriateness of a ruin. Bringing up questions of what makes a garden, this work creates a room within and a space without and interacts with nature in a three-dimensional way. As does a garden, it creates a sense of place. You turn the corner and walk into the small street, and everything changes. You are only, then, a few steps in from the wide, bustling multilane road – and you are still, of course, in the city, in the very center of its downtown area – and, yet, you are immediately in a place apart … or, perhaps, actually at the core of the silent but insistently beating heart that truly propels a city. It is the beat that you can feel, if you try, under the quotidian rumble and buzz. The quiet places, not the teeming boulevards, are what make great cities great; what soothes a soul is not the lively place you’re in but knowing that there’s a hushed place where you can go. There is something about a small city street. It is, elementally, little different from its larger siblings: cement and asphalt, brick and wood and glass, buildings and path. And, in an old city like this, built without plan: one kind of house cheek to jowl with one so unlike it, sometimes in gross ways, sometimes subtle. Constructed by different people at different times, with different desires and different ideas about what a city should be and what a street ought to contain. No city can be great without great little streets. Metropolises that have decimated the twisty, ancient parts of their downtowns to build superblocks, cities that have been designed or refashioned with the automobile in mind, suburbs that were devised with car-rivers but no pedestrian tributaries – all these have traded humanity for expedience, and made life more barren, and certainly less stimulating. Each large gesture needs a small one to be seen as such, and vice versa; one without the other creates an imbalance. For example, this little street you have just entered. It is one block long – an entry at one end, a dead end at the other, with high rises jutting up and above a short distance beyond. 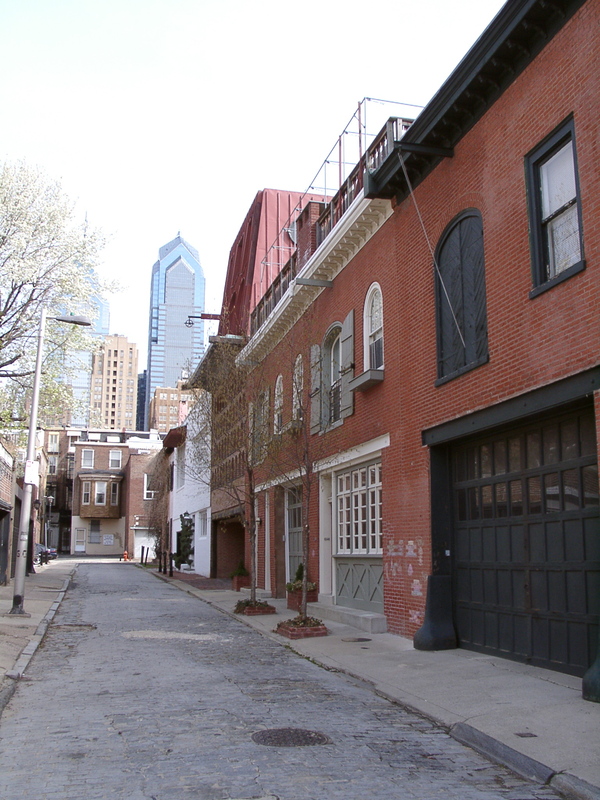 Houses line one side; garage doors and the backs of houses from an adjacent street make up the other. 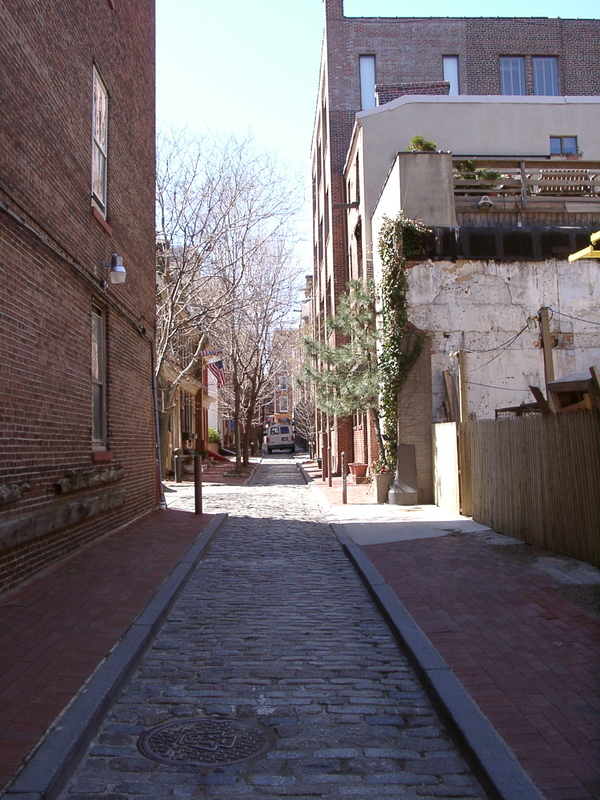 Not one house looks like the other, and not one of them dates back to the time in the 1800s when this street was laid out – so, it is not history, per se, that gives this street, with its poking-up cobblestones, its strong sense of place. Two of the houses are Modernist – one inexplicably, idiosyncratically and beautifully so – another is a latterly reimagined carriage house; there are only 4 or 5 residences on this street. Each house was planned, but as a collective there was no overriding plan or aesthetic. Intention and accident, artfulness and artlessness, cognizance of neighbor yet selfishness of taste and vision, disparate elements creating a totality that is somehow unified in its distinct placeness — that is what art is. You can never remember this little street’s name, if you ever knew it, and sometimes you can’t recall how to find your way here, but you can’t forget how it makes you feel when you find it: private and public, privileged and interloping, inwardly reflective yet outwardly attuned, explorer and castaway. City dweller, at least for the moment. Then you walk back to the busy byway, put 100 feet or so between you and that little street, and as it begins to slip into the past … oh, look: another one. Let’s enter this place, too, and see who we are in it. Generally speaking, the National Mall is a big dead space. Don’t misunderstand: This is not to say that it should be built upon or made hard-surfaced – Washington has too much of that already. But it is a missed opportunity for a lovely green swath that could be like parts of Central Park or the Tuileries. After all, there were plans for it starting with Pierre Charles l’Enfant in 1791, followed by landscape designs of Andrew Jackson Downing’s in the early 1850s, and it was even touched by the hand of Frederick Law Olmsted while working on the Capitol grounds between 1874-1892. As it stands, it isn’t exactly an emblem of what our better selves could be; rather, it is a pedestrian symbol of our reckless disregard for the bounty, promise and natural riches that this land has given as we have taken and casually abused it. Oh, sure, there is the event every four years that requires human multitudes to gather ceremoniously in a contained space in order to behold the new leader, but that could be accomplished in the streets every four years – there are plenty of those to accommodate. Grumbling aside, there is one small feature, a glimmer of civility and hope that provides not only a respite from the relentless wasteland but also a strong sense of place in an otherwise placeless tract. 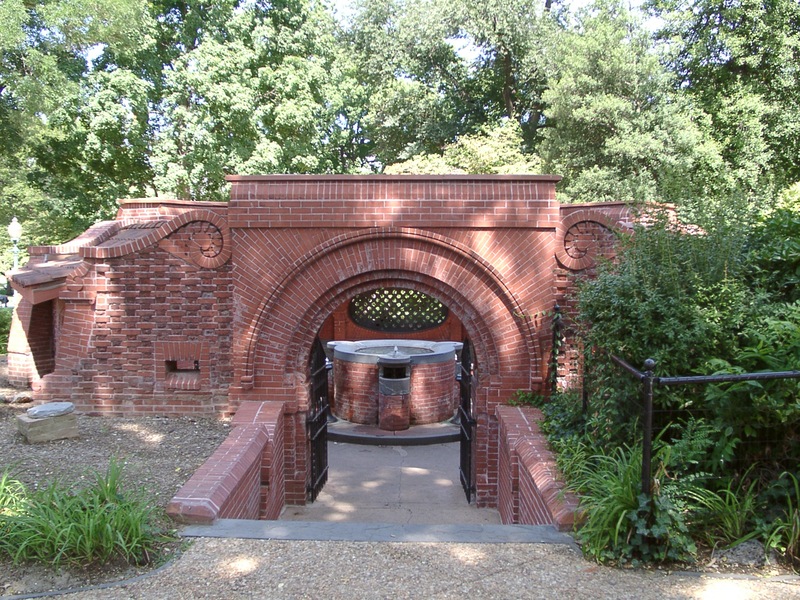 A diminutive brick structure pokes enticingly out of a sloping mound just north of the Capitol. It is decoratively curvaceous with its arches, volute parapets, undulating tile and oval windows. And it is short of stature, as opposed to the bigger-than-life structures that line the streets on either side of the Mall. 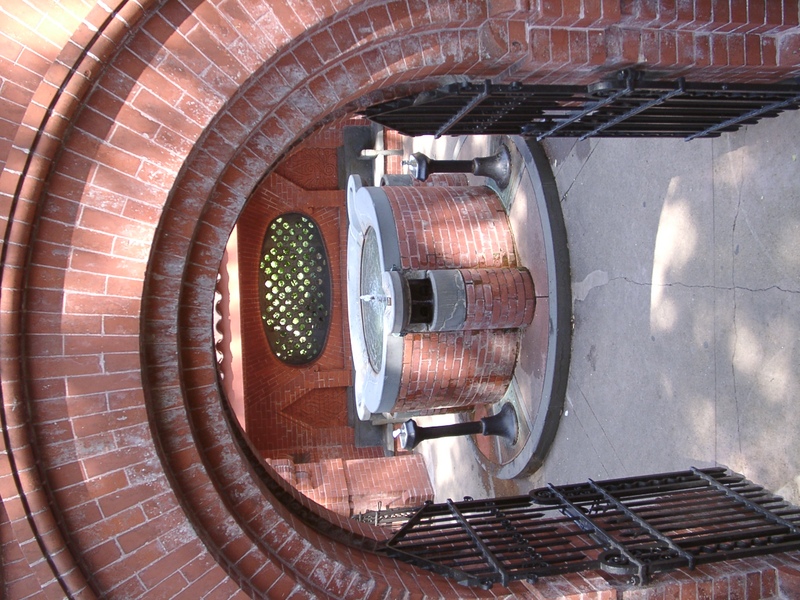 Its friendly demeanor beckons you to enter, down some stone steps toward a round fountain resembling an old well. The Mall is relentlessly open and hot, while this magical spot is shady and cool as an underground spring. 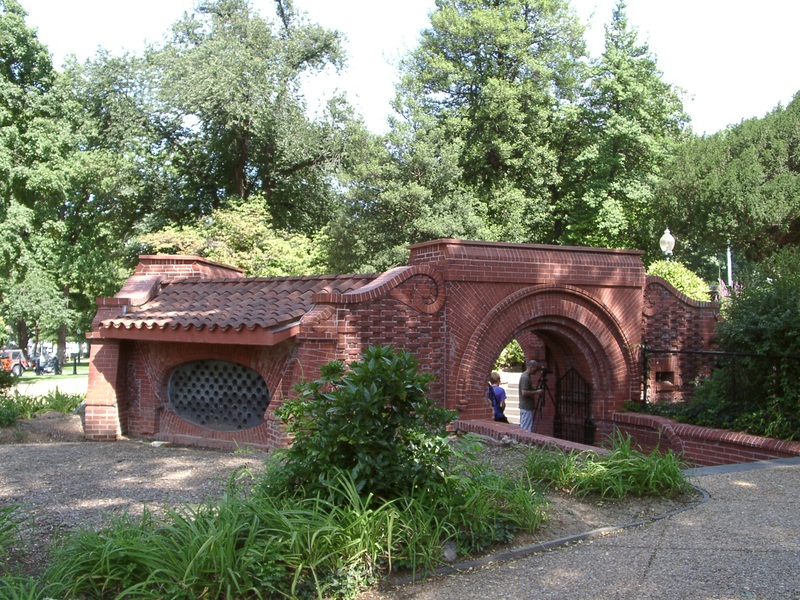 It is the Summer House, built between 1879-1881 and designed by Olmsted, all red brick and slate and looking like a Frank Furness building pushed into the ground. 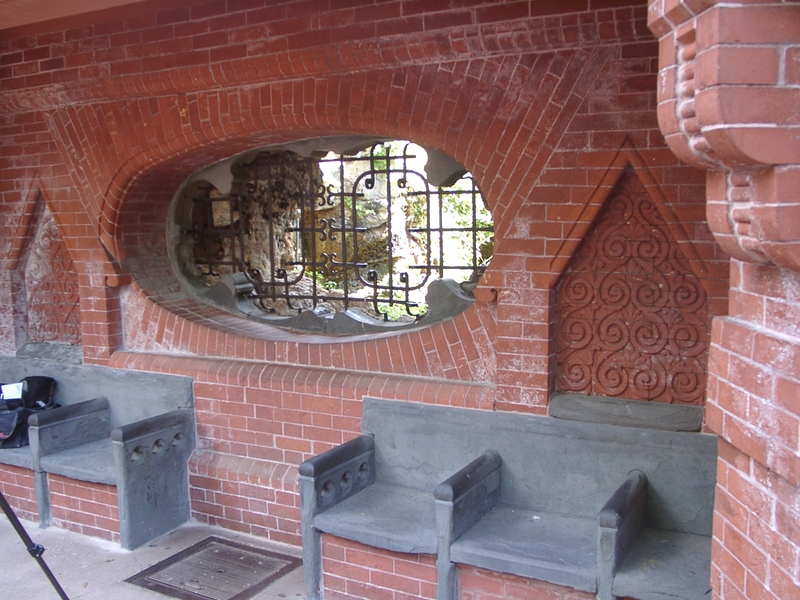 The Summer House has allusions to Chinese and Middle Eastern architecture with its shaped openings and niches, incised designs and decorative ironwork. When you enter the building (and you aren’t quite sure that you should because it doesn’t appear to be a public building – no signage, guards or queues – and it is very intimate), not only does the temperature drop by the double digits despite the open-air roof, but you are in a world familiar and yet unlike any you have seen before. The structure is a hexagon with three entrances, a kind of pagoda or garden folly but halfway below grade. It is very textural: the brick patterns, the contrast between the smooth gray stone and the more graphic brick that changes direction and becomes 3-dimensional, bulging out in places and then disappearing gracefully, creating openings in others. Lining the interior walls are benches made of slate, ceremonial seats that you might see in a waiting room, with shiny well-rounded arm rests creating separate seating spaces – twenty-two in all, for twenty-two lucky souls who find it and appreciate its charms. 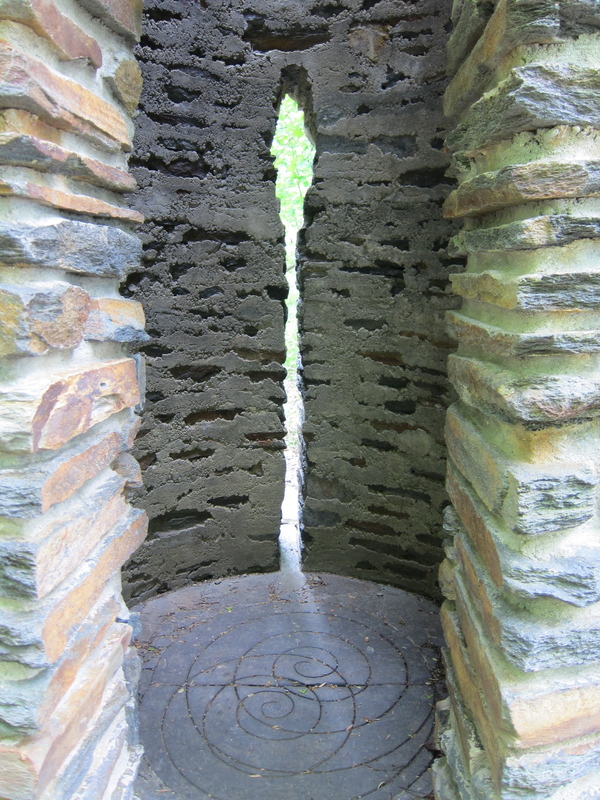 Two windows provide filtered light through perforated stone screens and allow glimpses of the surrounding landscape; a third, though, looks into an artificial grotto built into the hillock, complete with craggy rocks and dripping water to create the vision – a view into the center of the earth. There is here, in this unlikely place, a potential for reflection and refueling. Perhaps in the mile or so of its length, the Mall – a barren no-man’s-land that one hurries across, eyes fixed on maps, in the pinball-bounce back-and-forth between museums – offers no other sense of place, it being such an anti-place. Although, come to think of it, just adjacent to the Mall, toward the opposite end, is another powerful place-maker: the Vietnam Veterans Memorial Wall, by Maya Lin. Funny that it is also dug into the ground, gashed really, and it resonates in its own connection to its site. Much of the Wall’s impact, though, is in its chilling number of names as much as its reflective, tomb-like presence. Its sense of place has quite a different effect from the Summer House’s. Quite the opposite, since so much surrounding the Mall is monumental, in both senses, so you don’t expect something so magical and human scale – the Summer House – to be situated on it. This disconnect makes it seem as if it is a mirage. Really, it is an oasis. And it is so sweet. Precious, in fact. And despite its small, partly buried size, it is hugely important, not only for the respite it provides but for the place it makes. There are places – primarily in the Southwestern United States, Santa Fe and Taos, in New Mexico, among the most often mentioned – where, it is said, the power of life force is so strong, you can actually feel a vibration, or hear a hum under and around everything, or sense some sort of infrasonic waves above or beneath our ability to truly perceive them. A third-eye experience; an encounter, if you are inclined to believe in such things, with the spiritual, even the holy. In the city, our hums are likely the evidence of a busy self-defrosting refrigerator, our vibrations a passing truck full of the stuff that once was or is soon to become another structure that will want money from us. There are few places that even begin to hint at the profound. Yet, in Philadelphia there is one that we seek out often. It is in an unlikely neighborhood, but created by the likeliest of architects, sadly a prophet without honor not only in his own city but beyond. 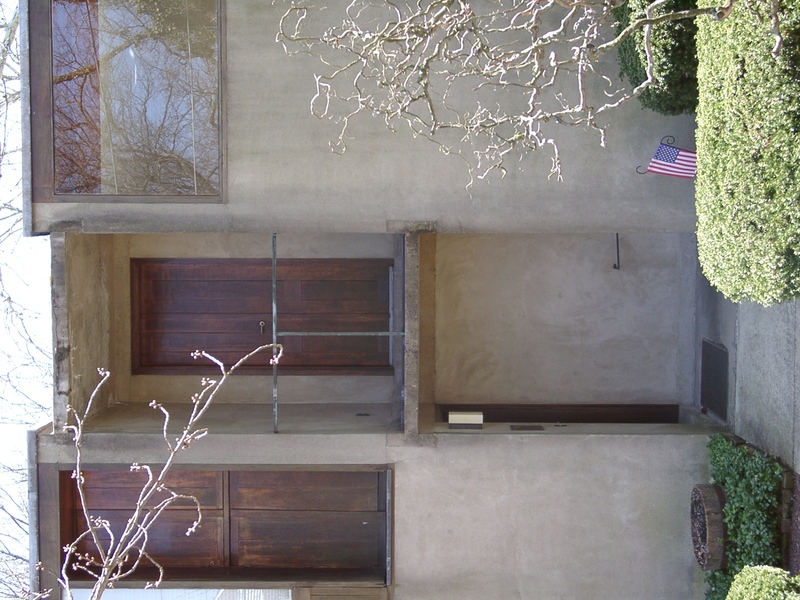 Down a small street, just at the curve of a cul de sac, in the Chestnut Hill section of the city – an area noted more for wealth than wonderment – is the so-called Esherick House, a collaborative venture by the noted woodworker and designer Wharton Esherick and the architect Louis Kahn, who had too few residential commissions (or any type of commissions, really) despite – or, perhaps, because of – his singular vision and use of “unfriendly” materials. 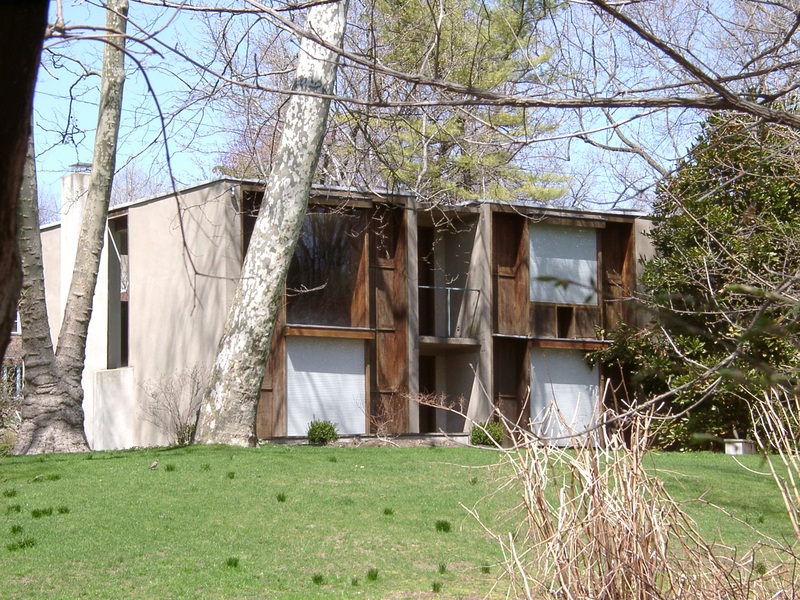 To describe it plainly, and, thus, superficially, the house – built for Esherick’s niece – is situated contiguous with a public park among mainly nice if not spectacular, though expensive, homes. 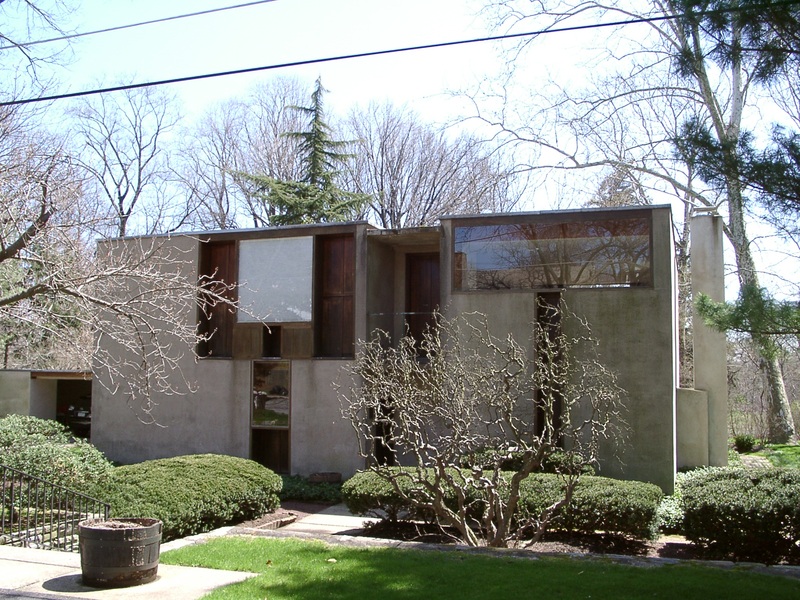 In a pairing that easily might not have worked, this Modernist rectangular solid brings together Kahn’s material of choice – concrete – with splashes of Esherick’s wood and planes of glass in a geometric Rubik’s Cube of a structure, sitting low to, and even below, the ground, and set back from the street in what could be described as a modest, even submissive pose. 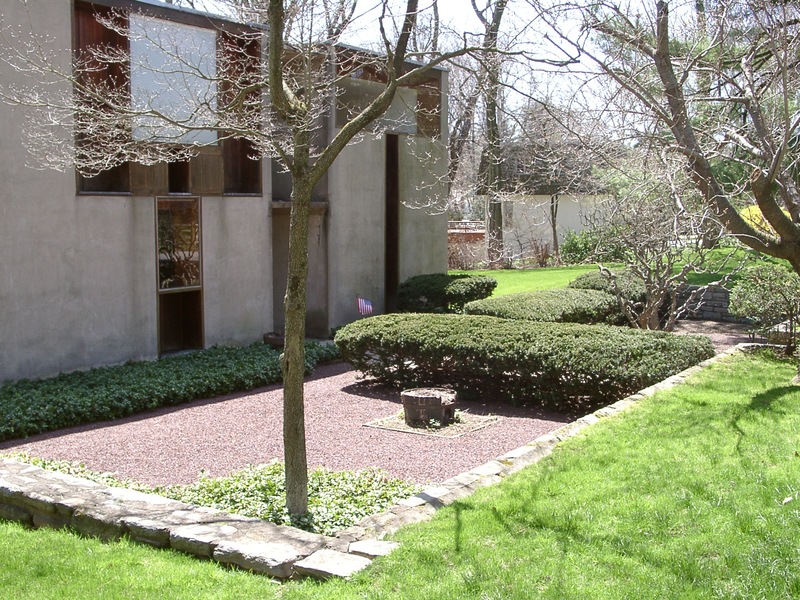 And as if it weren’t different enough in its context, its minimalist, yet impactful landscaping by Frederick Peck (in a true partnership of artistic intentions with Kahn) – a sunken cubist grid of planting areas interspersed among hardscape – appears at first to be nothing more than an afterthought, even, perhaps a building-code mandated bit of yard, but it separates the place even more, delineates it, frames it, completes it, creating a castle in a moat, or an island in a sea: a place of its own, open enough to see and nearly touch, yet different enough and removed enough and integrated enough, house-to-land, to be its own planet, but one we haven’t the craft, yet, to land on.